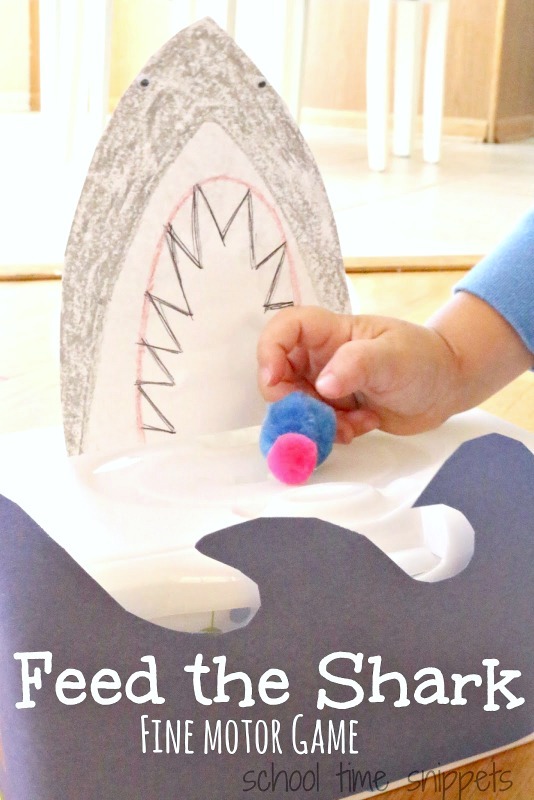 Toddlers and Preschoolers will have fun learning with this Feed the Shark Activity. Use it for color recognition, counting, addition, or just to work on fine motor skills! So many fun ways to play! Not a fan of real sharks, but doing some fun shark themed activities for Shark Week I am up for! I don't know how sharks got a designated week of attention anyways, but the summer months are the perfect time to add in some ocean themed fun and learning. With Shark Week fast approaching, I put together a simple shark themed fine motor activity for my toddler! It is a wonderful and fun way to learn and play together! Use this playful activity to talk about colors, practice counting, and strengthen those fine motor skills with this Feed the Shark Game. Fine motor skills are the coordination of the muscles in the fingers and hand. They are necessary for when your child is older and is learning to write. There are a great number of ways to strengthen those fine motor muscles-- one of which is learning to pinch and grasp items. To get started you'll need to cut waves from a blue piece of construction paper and a triangle like shape from white construction paper for your shark. Color the shark gray, add some sharp teeth, and googly eyes. Next tape the waves to the bottom half of he wipes container. Open the little flap on top of he wipes container and tape the shark head. 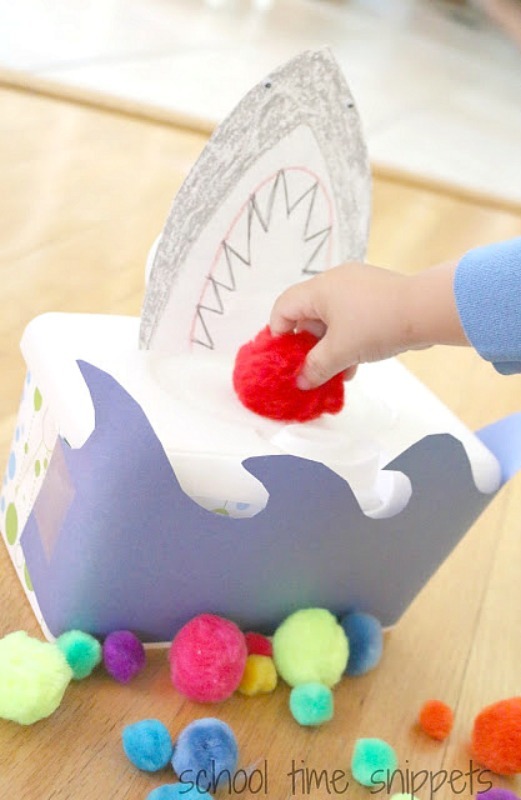 Lay out a bunch of pom poms and invite your toddler to feed the shark! Or make it a game by adding in a die and seeing who can feed the shark 10 pom poms first! So many possibilities with this simple fine motor shark game! If you have an older kiddo, he/she may like to put together a Shark Lapbook! Will you be having any shark themed fun in your home soon? This is a fun and simple playful activity to do with your toddler.